The situation of Matthew Miller, arrested in North Korea, is further embroiling the Hermit Kingdom in an increasingly peculiar mess as it announced the American traveler’s sentence this week. According to reports by the Associated Press Matthew Miller has been sentenced to six years hard labor for his crimes. This case has gotten even stranger with Miller claiming that he came to the country with intentions of being arrested. According to reports he ripped up his visa while in the Democratic People’s Republic of North Korea demanding asylum. While he has not specified what crime he committed during an interview with CNN he said that he was guilty of committing a crime and that he did this on purpose. North Korea has claimed that Matthew Miller was wishing to gain international fame by becoming the “second Snowden”. Matthew Miller came into North Korea through a tourist booking industry called URI Tours. Though the United States does not have an embassy in North Korea, it is legal to go to the isolated country, although the State Department states that it “strongly recommends against all travel by U.S. citizens to North Korea”. 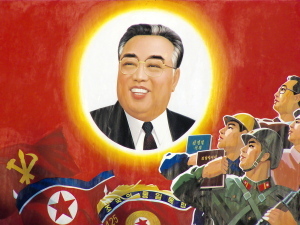 The North Korean state, which has been ruled by the Kim Family since its split with South Korea, follows the Juche ideology popularized by Kim Il-Sung. The ideology differs drastically from the Marxist-Leninist tradition and focuses more on ‘Korea First’ policies while relying on nationalist tendencies rather than a historical materialist perspective. North Korea finds itself with one of the world’s largest militaries but also with some of the highest rates of poverty in the world. Kim Jong Un has asserted his leadership and power through covert means, infamously executing his own uncle in January in what many believe was an attempt to demonstrate his power in the Hermit Kingdom. Though Kim Jong Un has continued his father’s tradition of contempt for the United States, even calling for war against the US if Seth Rogen’s movie The Interview is released, he finds himself reliant on US humanitarian aid to feed his people. As the US will inevitably prepare a case for the release of these US prisoners, the question to ask is whether or not Kim Jong-Un will use this situation to try and increase his public power domestically, or cooperate with his sworn enemy.